Arena Industries have developed a ballistic eye-protection system which includes features that address the primary complaints of tactical goggles; fogging, comfort and moisture leaking onto the inside of the lens. All of these issues have made tactical ballistic goggles optically ineffective and uncomfortable to wear. Our protective eyewear has moved the industry forward by introducing patented features that are not and cannot be challenged by any other manufacturer. With our aggressive pricing and our superior features, no-one in the ballistic eyewear arena can compete with the value we offer. These features, value and improvements include the following. The true passive anti-fogging system sees a patented razorback design air flow system allow for air to flow over the goggle lens preventing the lens from fogging. We use electro-static materials in this system to repel dust and debris from entering the airflow system. Our hinged buckle allows for goggle placement at any angle on either the soldier’s helmet or head. The hinge is much more durable and versatile than the snap on hinges other manufacturers offer. Moisture wicking foam and fabric keep moisture from dripping onto the inside of the lens and distorting vision. Hot weather conditions combined with strenuous activities cause sweat. Our foam and wicking material is a significant improvement over the bare plastic goggle frame. All Arena Industries military products utilise both clear and grey military standard lens tints. ECHO1 USA Mini gun released! Pre-order now! Here are the latest tests we have run with the BBB DIMPLEX. I have also included the drawings of our first prototype. I have eliminated all the technical references from the drawings. The tests were executed at the 100m underground rifle shooting range in Sarganz, Switzerland. So wind was not a factor. We used a stock Tokyo Marui VSR-10 Pro Sniper Version with a 6.1mm tight bore high performance Teflon coated barrel. Manufacturer specifications of this gun are MOA of 4cm from 10 meter range and maximum range is 50 meters without upgrades. The new barrel gave us slightly better performance than the stock. The rifle was bolted to a bench rest so that it could not move at all. We used a barrel laser (it replaces the bolt assembly) to zero the rifle precisely in the centre of our target. Exactly 100 shots were fired for each of the 3 tests for a total of 300 shots of BBB 0.20g and 300 shots of the BBBDIMPLEX. The 1st test was to check for an accuracy difference between normal BBB 0.20g and the BBBDIMPLEX. A paper target was placed at 10 meters and changed after every 10 shots were fired. The rifle was laser zeroed after every change of target. The results represent the average distance measured from the center of the target (where the laser dot landed) of every group of 10 shots fired. We achieved the TM stock specifications of the rifle using normal BBB 0.20g and improved that considerably using the BBBDIMPLEX. Sorry to bother you again, but I thought I’d just let you know we have got a new PRE-ORDER on at the moment – the Marui M4-PMC, which is a limited edition gun and is expected out around the 16th September. Then, we have the Tanaka SAA .45 4 /34 inch Civilian (Gas Shell) which has the individually charged gas shells seen in the new Tanaka Cassiopeia series guns. I’ve attached a couple of photos for you! This is a Super Gas Pistol for IPSC Open Class. Sophisticate design that will not neglect the essential inner building. Inner Barrel Holder and Loading Muzzle could improve the straight and smooth shooting. Come with the hybrid Steel Barrel, which is one piece over all design and engraved with warning words. Professional Doctor Len, Steel Thumb and Grip Safety that bring you the amazing shooting experience. Welcome any enquire for detail custom parts for this collection. HSS Gear is designed for Law Enforcement and military at highest standard and quality. Our gear is the best price/ quality products in the market. 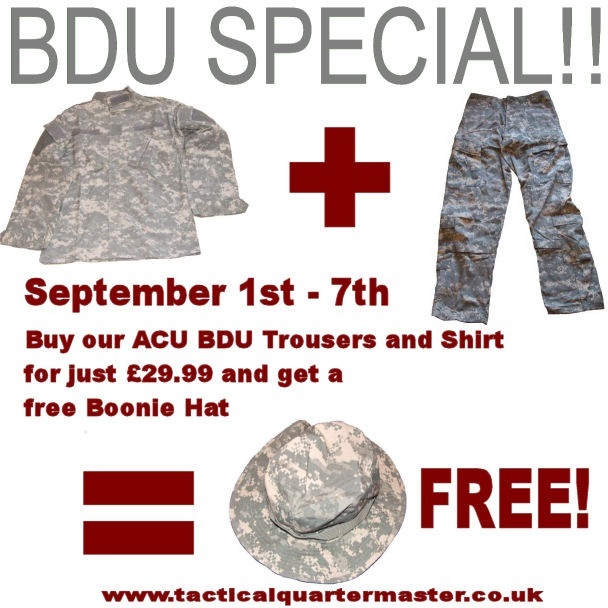 From 1/9/08 – 7/9/08 we are running a special on our ACU BDU Trousers and shirts. Get both for just £29.99 and we will include a free boonie hat. Also check out our eBay store for a summer special on our Combat Cool Shirts! Ready to ship inokatsu m4? Airsoft sites in the UK excluding under 18’s?